Once again, I'm in Downtown attending a conference. Time to learn something new or to expand my horizons. Nah, not really... It's the perfect opportunity to eat! With so many great restaurants within walking distance, I was as giddy as I could possibly get. Cunningly, I rounded up some of my co-workers to join me in some culinary delights. We decided (well, more like I decided) on visiting an old favourite of mine when I used to live in downtown. The place is The Elbow Room, which is part diner and part improv. With your plate of food, there is generally a large side of abuse and humour. 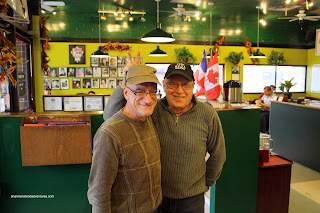 Patrick and Brian have been operating this Vancouver favourite since 1983 when it was located at 720 Jervis Street. They moved to its current location in 1996 and have been giving patrons "attitude" ever since. 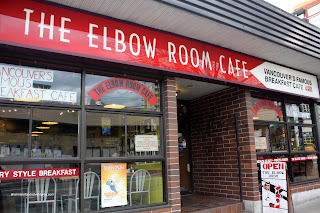 As evidenced by the pictures of various celebrities on the wall, The Elbow Room is more than your regular diner. People come here for the shtick. But what about the food? Well, I decided to have brunch "My Way". No, I did not break into song like ol' Blue Eyes; although it does seem like I get my way when it comes to the picture taking. Everyone knows by now that if they dare touch their food before a picture is taken... Anyways, My Way is an an omelet with baby shrimp, bacon, avocado, Camembert and feta cheese. Cranberry toast was served on the side. 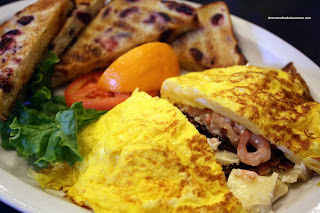 If you were expecting a French omelet, you can stop reading now. As mentioned, this is a diner. Predictably, the eggs were a bit overcooked. It's really too bad the cheese did not get a chance to melt much. Ultimately, the omelet was still good; but it would've been better if the cheese had melted and adhered to all of the other components. 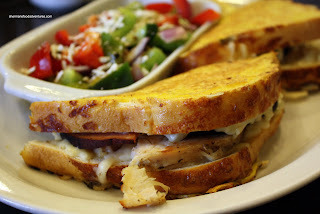 Pomegranate went for the Monte Cristo (Two slices of bread dipped in egg, with turkey and black forest ham, smothered in mozza cheese and grilled to perfection), which is not necessarily the healthiest sandwich; but when done right is pretty darn good. This one was not bad. 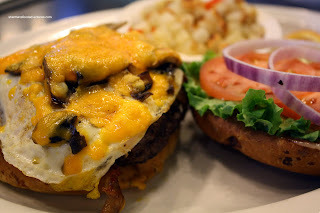 Ma ended up with the Boss Burger (Mushrooms, bacon, a fried egg and cheddar cheese). She liked how the patty was moist while being cooked all the way through. L-Pete also had a burger and pretty much echoed the same sentiment. However, the side of hash browns didn't garner the same enthusiasm. A bit small, and not really that cooked, it was an afterthought. Hot Mama had the House Salad and it looked quite substantial. 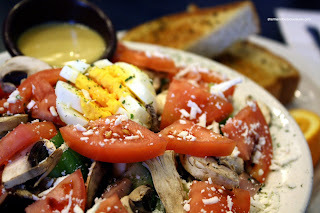 Loaded with red leaf lettuce, diced black forest ham, green and red peppers, mushrooms, tomato, sliced avocado, boiled egg, and feta cheese, she enjoyed it very much. But then again, for me at least, a salad is a salad. What can I say, I love meat! Now, the Elbow Room has decent (not great) food. You can do much better for the same price at a number of places in Yaletown, such as Provence Marinaside (especially for brunch) albeit a different type of restaurant. This brings up an interesting point. The food is okay; yet the portions aren't exactly humongous. At the prices they charge, you'd expect it to be. But people who focus on that alone are missing the point. There are so many restaurants these days that can be complete clones of each other and no one would notice any differences. In a sea of boring, the Elbow Room provides an eatery with character and owners that care (despite their insults). That's what makes the Elbow Room unique and a place where people don't mind being called "honey". Protions could be a bit bigger? I guess they must have been big enough with the way you eat since you finished all your food and not have to make a donation. Surprisingly, the portions were not huge. I remember then being bigger? No idea. Everyone finished their food easily. That toast looks amazing... I am totally going to bake that at home this weekend! Yup, it was pretty good. I didn't say much about it; but it was crispy and had a nice sweet tang. Isn't there a rule that if you don't finish your portion of meal, you have to donate $? And isn't it true that they don't refill your coffee? But you gotta do it yourself? Anson, you are right on both accounts. However, everyone finished their food. That's why I remarked that the portions have shrunk.